Back From The Dead? Reported Sightings Fuel Hope For Return Of Tasmanian Tigers : The Two-Way The last known Tasmanian tiger died more than eight decades ago. It has become the stuff of textbook sketches and yellowing photographs. But now, researchers are launching a new search. 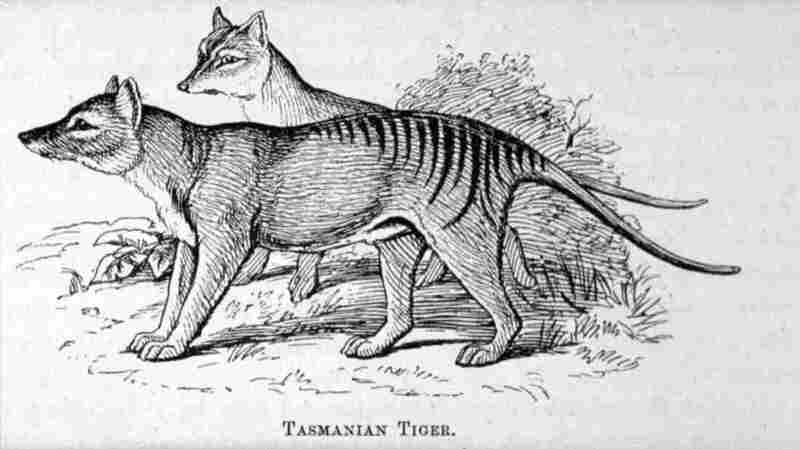 The Thylacinus cynocephalus, a masupial known by many by the name "Tasmanian tiger," has been merely the stuff of sketches for decades. Here is a print of the animals first published in Louisa Anne Meredith's 1880 Tasmanian friends and foes: feathered, furred and finned. It has been more than eight decades since the last known Tasmanian tiger died. In that time, the marsupial has become the stuff of textbook sketches and yellowing photographs, little more than a memory aging into oblivion. Recent "plausible sightings" have challenged the accepted wisdom that the animal has gone extinct — and have inspired researchers at Australia's James Cook University to commence a quest to find it themselves. Let's clarify one thing right away: this animal is no feline. In fact, it's a marsupial — in the same family as kangaroos — but its face looks a lot like a dog. "It's a dog with a pouch," the university's Sandra Abell tells All Things Considered. She's one of the people leading the search in Queensland, Australia. "It has a very dog-like face," she says, "but its back and the tail in particular looks a little bit kangaroo-like. Its hind quarters are very distinctive — so they have stripes on the back end and that large tail, very interesting looking." The researchers also plan to use the cameras to collect more general information about declining populations of mammals in Australia. Abell says that north Queensland has recently experienced "small mammal crashes," and the tapes might help explain why. 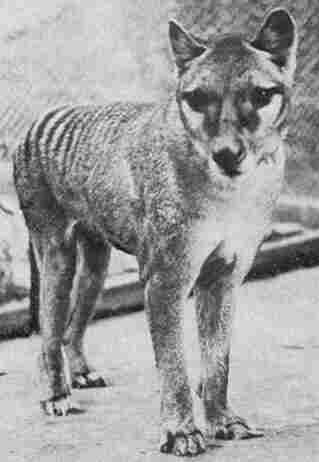 Once common in Australia and Tasmania, the last known Tasmanian tiger died in 1936 at Tasmania's Hobart Zoo, according to the Australian government. In 1986, the species was declared "extinct by international standards," the Tasmanian government adds. 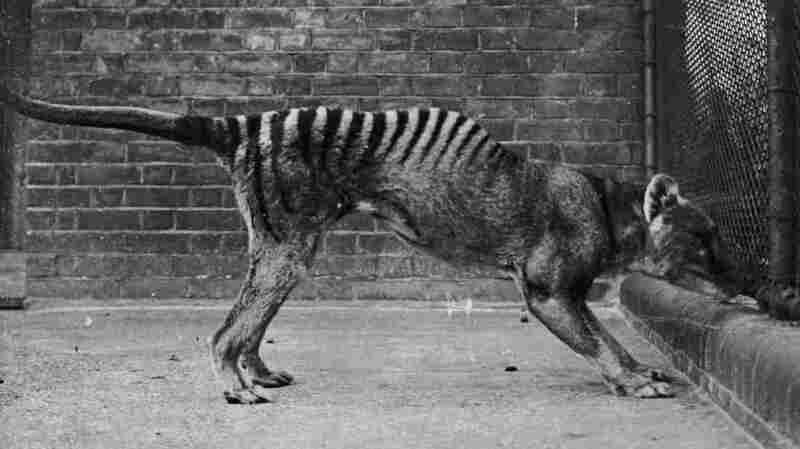 There's even a group — the Thylacine Awareness Group of Australia — that tracks reports and is dedicated to the idea that the Tasmanian tiger still exists.
" 'I hopped out of bed and put her [the dog] on a short leash, grabbed a spotlight and started to look around the camp towards the ravine area where I'd been walking the dog previously,' he said.
" 'These animals, I've never seen anything like them before in my life,' he said.
" 'They were dog-shaped – I had a shepherd with me so I certainly know what dogs are about – and in the spotlight I could see they were tan in color and they had stripes on their sides." "This isn't a mythical animal, this is something that is real. We have real fossils and we have images and video footage of this real animal," she said. "But the probability that it will be discovered is very low, so I'm not persuaded that they're out there. For me, I'll need some hard data to be able to satisfy my curiosity." She adds: "I really hope they're out there. I think it would be an amazing thing to discover."